Extrusion ice cream machine(ice cream extruder) is a complete line for produce magnum ice cream, funny face ice cream, log ice cream, cake ice cream, san-dwich ice cream, wave ice cream or any other abnormity ice cream. Assembly by cooling tunnel, extrusion head, ice cream cutter, stick i-nserter, manipulater, chocolate dipping tank, still packing machine. 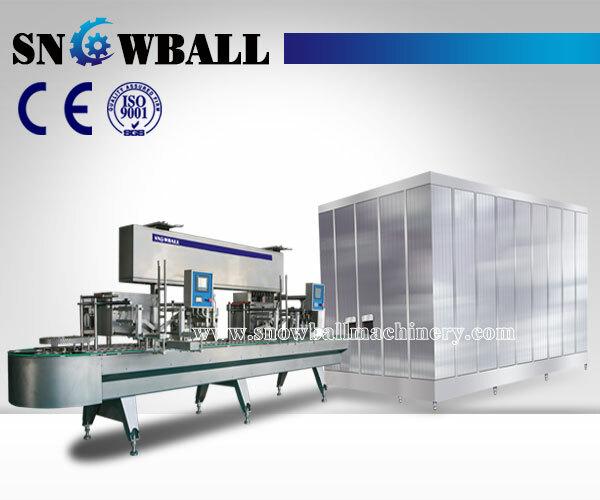 The most common manufacturers of these equipments are APV GLACIER, CATTA 27, GRAM, HOYER, MATRIX-VOJTA, TECHNOGEL, TEKNO ICE, TETRAPAK, WCB ICE CREAM. 3. The equipment decreases the production consumption, greatly increase the production ability, an-d lowers the productions cost .